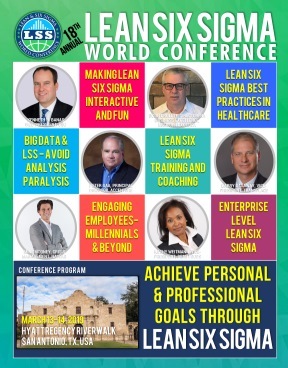 Lean Six Sigma World Conference - Lean Standard Work, a Concept for Every Environment? Lean Standard Work, a concept for every environment? In deploying Lean within USG we have learned many valuable lessons. One lesson, crucial to any lean deployment, involved learning and deploying the lean standard work concept. In a manufacturing environment in which some associates are utilized as machine tenders, standard work can be a difficult concept to grasp. We want to share our learnings and help others understand how this integral concept and tool of lean can and will work in any environment. o Definition – Standard work is an integral part of lean manufacturing. o The goal of standard work within a process is reducing variability in job performance by documenting and training operators “the best way we know today”, to perform that process. In a process or service, a problem can be linked to one of three conditions:- Lack of a standard.- The standard was not followed.- The standard is insufficient. Work design with the intent of organization learning built in. Problem identification, what is standard/Normal? o Work is performed manually. o Work is key to the management of the organization. o Standard Work In Progress is important. Visual documents to be used by leadership to assess adherence to performance standards. Where do we start? Developing a plan for developing standard work. How Standard Work has helped us! o Discovered the importance of standardized processes in identifying normal/abnormal conditions. o Benefits of standard work when bringing on new associates. Faster onboarding times, with higher degree of success. Repetition – what does repetitive mean in relation to standard work? Important to the management of the business – What qualifies as important?